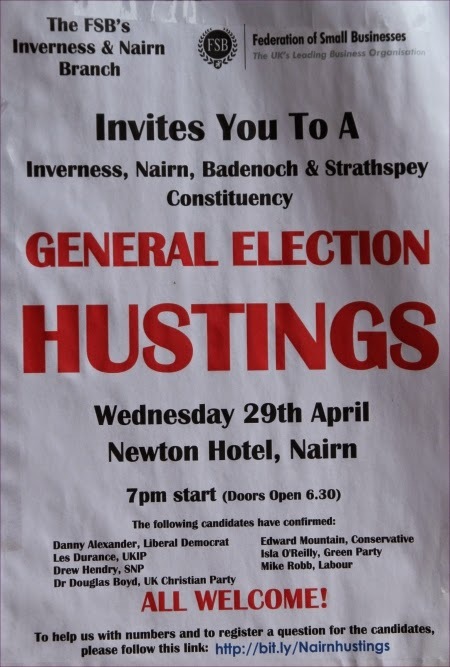 A Gurn from Nurn: General Election hustings tonight starts 7 p.m. (29th) Newton Hotel - Hear and question your candidates? General Election hustings tonight starts 7 p.m. (29th) Newton Hotel - Hear and question your candidates? Couldn't manage it tonight luvs. Unavoidably detained... How was it? Danny Alexander, really? In his own constituency where 30% of folk are living below the poverty line in Inverness and in Nairn where 1 in 4 bairns are growing up in poverty? A Tory toady knows no shame. I thought his absence from election leaflets (neither named or pictured) meant he'd opted for the Tory gift of an unelected seat in the House of Lords at the ripe old age of 42, £300 per day - a reward for being Osborne's poodle. Yes there is no seat reserved for Fanny & Alexander in the Candelabra Shelter & that's a fact! Well luv, to cut a ver long story short, t all went a but Pete Tong for Auld Pooks, a bit harum scarm, nods as good as a wink etc etc blah blah. But I'm back now and preparing for the end of the world. As you do. serious question Pookie. Who do you think is the sexiest candidate? Well I must admit, the name Edward Mountain has an impressive ring to it. But then again what's in a name? Would a rose by any other name smell as sweet as ye auld bard once quothed. Anyway I would rather stick pins in me eyes than get cosy with a tory. Well that's mighty kind of you to say so, but as to the thorny subject of surviving the inevitable nuclear winter in The Shelter du Pooks, I'm afraid I do have a rather long list of candidates, not to mention several mariachi bands and my extensive collection of stuffed mammals to consider... maybe a hustings is in order...? Daaaaaling Pookie how the hell are you? long time no comment have you been basking in the sun down in St Tropez again with Charlie Wigglebottom Cuthbert Sabastion Smyth & his chums, I have dreadfully missed your wry sense of humour & frivolity one does now hope you will be a regular back on the Gurn & keep us updated on your goings on rubbing shoulders with the elite & celebs, fingers crossed ! May I thank Pookie for having the courtesy to reply its a sign of very good manners must agree with her view on St Tropez I was a regular there in the sixties its not what it used to be, a bit like Nairn now I suppose which is a shame but things do change sometimes sadly not for the better, oh I must stop gurning it plays havoc with my wrinkles!